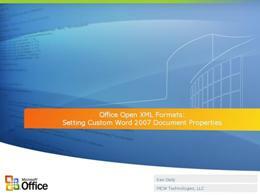 2007 Microsoft Office system documents allow you to set and retrieve custom document properties, so that you can store your own document metadata. In Microsoft Windows, you can use this metadata as a tool for searching and categorizing your documents. Imagine that you need to set custom document properties on documents stored on a server. One option is to load each document individually in Microsoft Office Word 2007, set the property, save the document, and move to the next document. Because of the new Office Open XML File Formats, you can also achieve the same goal programmatically, without loading each document into Word. This technique requires a measurable amount of program code, but the code is efficient and provides you with the best performance. Working with the Office Open XML File Formats requires knowledge of how Word stores the content, the System.IO.Packaging API, and XML programming. To get started, download a set of forty code snippets for Microsoft Visual Studio 2005, each of which demonstrate various techniques working with the 2007 Office System Sample: Open XML File Format Code Snippets for Visual Studio 2005. After you install the code snippets, and have a sample Word document with which to test, you’re ready to go. For details, see Read It. Create a Windows Application project in Microsoft Visual Studio 2005, open the code editor, right-click, select Insert Snippet, and select the Word: Set Custom Property snippet from the list of available 2007 Office snippets. If you use Microsoft Visual Basic, inserting the snippet inserts a reference to WindowsBase.dll and adds the following Imports statements. If you use Microsoft Visual C#, you need to add the reference to the WindowsBase.dll assembly and the corresponding using statements, so that you can compile the code. (Code snippets in C# cannot set references and insert using statements for you.) If the Windowsbase.dll reference does not appear on the .NET tab of the Add Reference dialog box, click the Browse tab, locate the C:\Program Files\Reference assemblies\Microsoft\Framework\v3.0 folder, and then click WindowsBase.dll. If the custom.xml document part does not already exist, the code creates it. The remainder of the actions assume that custom.xml exists in the document. If the requested property does not exist, the code creates it, using the specified type. If the requested property does already exist, but its type does not match the type you specify in the call to WDSetCustomProperty, the code changes the type and sets the value. If the type you specify matches the current type, the code simply modifies the value of the property.
' Create a custom property.
' Change an existing custom property's type.
' Modify an existing custom property. // Change an existing custom property's type. // Modify an existing custom property. If you insert the snippet more than once, you find this enumeration inserted multiple times as well. Dim propertyTypeName As String = "vt:lpwstr"
' Calculate the correct type.
' and if so, format in the correct way.
' represent a UTC date/time.
' Must be lower case!
' Next code block goes here. //  Calculate the correct type. //  value passed in should represent a UTC date/time. //  Must be lower case! //  property to a valid value, throw an exception. // Next code block goes here. After declaring constants that the code needs to navigate the relationships between the document parts in a Word document, as well as constants defining the namespaces the code needs when searching for nodes in the XML content, the code declares a few variables it uses throughout the procedure, including the propertyTypeName variable. Assuming that most properties you set are strings, this variable is initialized to the value vt:lpwstr. The code uses the property type you specified to set the propertyTypeName variable to one of the values Word can accept (vt:lpwstr for strings, vt:filetime for date/time values, vt:i4 for integer values, and vt:r8 for double-precision values) and converts the property value into a string for insertion into the XML. If the code could not convert the property you specified into one of the types it accepts, it throws an InvalidDataException error.
' Get the main document part (document.xml).
' There is only one document.
' Work with the custom properties part.
' Get the custom part (custom.xml).
' It may not exist.
' if it exists at all. //  Get the main document part (document.xml). //  There is only one document. //  Work with the custom properties part. //  Get the custom part (custom.xml). It may not exist. // if it exists at all. //  Manage namespaces to perform Xml XPath queries. The code block finds the document part, by calling the Package.GetRelationshipsByType method, passing in the constant that contains the document relationship name (see Figure 3). The code then loops through all the returned relationships, and retrieves the document URI, relative to the root of the package. You must loop through the PackageRelationship objects to retrieve the one you want. In every case, this loop only executes once. Although it is useful to see how to retrieve a reference to the main document part, in this particular snippet, that code is vestigial, the snippet does not use that reference to do its work. Next, the code uses the same technique to attempt retrieve a reference to the custom properties part, which may not exist. At this point, the customPropsPart reference might still be null. Finally, the block sets up an XmlNamespace manager, adding in namespace information for the XML content it queries later, and sets up a URI for the custom properties part.
' Part doesn't exist. Create it now.
' Set up the rudimentary custom part.
' properties part into an XML document.
' Next block goes here.
' Save the properties XML back to its part. //  The part does not exist. Create it now. //  Set up the rudimentary custom part. //  new custom properties part. //  into an XML document. //  Save the properties XML back to its part. If the code determines that the custom properties part does not exist, it starts by creating an XmlDocument instance, using the name table the code created earlier. It calls the Package.CreatePart method to create a document part, using the appropriate content type (application/xml). The code sets up the minimum XML content for the part (see Figure 4 for the details), and finally, creates the root relationship (see Figure 3 to see the relationship it creates). If the document part did exist, the code simply loads its content into the XmlDocument instance, and sets the rootNode variable to refer to the document element of the document part’s content. The block ends by writing the custom part back out to the document stream, saving the changes you see made in later code blocks. //  You found the node. Now check its type. //  The types are the same. //  Replace the value of the node. //  has not changed, you are finished. //  and clear the node variable. Dim pidValue As String = "2"
//  numeric, but it never hurt so to confirm. This block of code only executes if the property node either does not exist, or was deleted because its type was incorrect. Each property in the custom property parts has an assigned id value, and the lowest-numbered value is 2. This block of code finds the highest value, and increments it to create an ID value for the new node. This code creates the various bits and pieces required to create a property node in the custom properties part (Figure 4 shows how the finished XML content should look). After it completes, this block sets the return value to True. Select Document Panel, and in the Document Information Panel dialog box, click OK. This action displays a set of standard document properties at the top of your document. Click the Document Properties down-down arrow, and select Advanced Properties, as shown in Figure 1. Figure 1. Select Advanced Properties, to set a custom document property. In the Document Properties dialog box, click the Custom tab, select one of the suggested custom properties (or add your own), select a data type, enter a value, and click Add. Figure 2 shows the dialog box before you click Add. Note that the only data types available to you are Text, Date, Number, and Yes or no. Add several properties of different types, if you like. Click OK when you finish to dismiss the dialog box. Figure 2. Add a custom property. In Windows Explorer, rename the document Demo.docx.zip. Open the ZIP file, using either Window Explorer, or some ZIP-management application. View the _rels\.rels file, shown in Figure 3. This document contains information about the relationships between the parts in the document. Note the value for the custom.xml part, as highlighted in the figure—this information allows you to find the specific part you need. Figure 3. The .rels file contains references to each of the top-level document parts. Open docProps\custom.xml, as shown in Figure 3. The highlighted element in the figure contains the name, type, and value for the custom property. The snippet you investigate either creates this element, modifies its value if the value already exists, or changes the value and type if it already exists but its type does not match the new settings. Figure 4. The custom.xml part contains the custom properties. Close the tool you used to investigate the presentation, and rename the file with a .DOCX extension.